Volunteer abroad with GVI and choose from over 150 hands-on volunteer projects based in amazing locations around the world! Make a sustainable impact, discover new countries and engage in a meaningful cultural exchange. For over 14 years, GVI has been operating globally and helping volunteers find their perfect project! With over 8 different focuses, we are sure that you will find a project that will match your interests in one of the 12 countries we operate from. 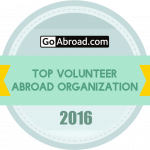 To see our variety of focusses, check out our volunteer abroad programs. Volunteer for a week or up to a year, combine our projects for unique multi-country combos, become an international expedition team member, take a gap year with a difference, or flesh out your resume with one of our various internship options! If you are studying, speak to our Country Experts about receiving academic credit. Our Programmes don’t just give you hands-on practical skills, but can also contribute towards your university or college qualification.